The Feather Customizable Sectional is a large designer upholstered gray fabric wonder, which accommodates six people comfortably, its reversible back and seat cushions are feather filled and wrapped in a cottony soft fabric for cloud-like comfort. Crisp, clean lines and track arms make it the ultimate sectional for entertaining, furnishing a family room or TV viewing room. Rich textured pillows with metallic finish or bold colors would elevate the look as well as an ottoman or a coffee table. Be sure to check the Inhabitr living room section for our complete collection and choose the rest of your living room items. Rent this sectional from Inhabitr today! 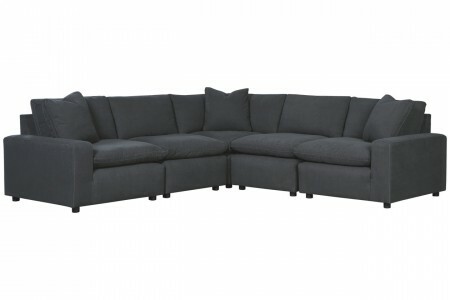 The sectional is combined of 4 pieces: - Armless, Right arm, Left arm and corner pieces.